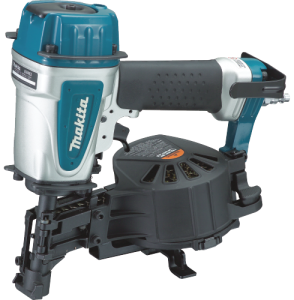 A pneumatic nail gun is a popular tool used in roof repair Denver. It uses compressed air to drive nails into surfaces in less time than it takes to hammer them. Nail guns save roofers a lot of time since they drive nails faster and more efficiently. We looked at one of the pneumatic coil nailers in the market today – the Ridgid Model R175RNE 15-Gauge Roofing Coil Nailer- and reviewed its features and customer feedback to help you decide if the product is a worthy addition to your roofing tools. The product boats of several special features to make its use easier and more convenient, one of which is the transparent magazine cover. The clear view design gives the user a real-time update of the nail supply inside the chamber, thus eliminating guesswork on the number of nails left. It has a replaceable nosepiece with carbide inserts that effectively extends the tool’s life and lightens maintenance work. This model of the Ridgid Coil Nailer is built with a selectable trigger that gives the roofer an option to use either contact fire mode or sequential fire mode for precise placement of nails and increased productivity. Full Strike and Fasten Edge Technology that creates maximum air power in a compact size. Dry-fire lockout design to prevent misfires and lengthens the life of the motor. A magnetic holder that prevents dropout of the last nail in the magazine and promotes easy loading of nails. A removable shingle-guide adjustment for precise placement of shingles. EZ load design for quick reloading. Plate guards to prevent accidental sliding of the tool on roofs and protect against abrasive surfaces. As good as the tool is, negative comments by people who bought the product can still be found. One user’s complaint is directed not against the product itself, which the user found to be excellent, but on its poor warranty registration. Despite what the manufacture says about its lockout design to prevent misfiring, a user experienced misfiring after using the tool for an hour. Tweaks and adjustments made by the user did not correct the flaw. Complaints were also made against the durability of the product. The plastic pieces of the tool broke into pieces after it was dropped. Since accidental dropping of tools is an expected and inevitable occurrence on any roofing job, the seemingly-fragile condition of the product is definitely a minus factor. Based however on another customer feedback, particularly people who have used the product for years, durability and functionality are not an issue. They expressed full satisfaction over their purchase and use of the product. Overall, we give this product a positive rating that would deliver value for its price.